TH E M R EP O RT | 13 In Search of Work-Life Bliss Source: Share of income* *Share of Income—percentage of income that would be needed to pay a mortgage. Each city percentage is based on current median household income and median home value in the market by evaluating numerous data sets. The team evaluated each market's historical home price indices, housing supply data, days on market, median household income, median home price and more. 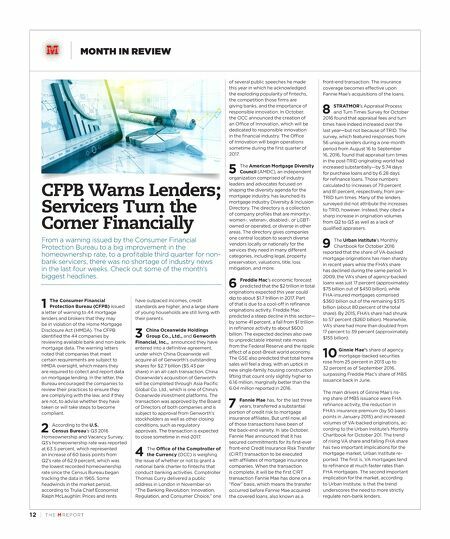 The team also compared "median home price" and "median household incomes" to determine what percent of a typical home budget would be spent on a mortgage if purchased today. The result is a re-ordered "top 10 city" ranking around home affordability. So, where does one find work- life bliss? Bliss may be in the heart of the millennial beholder, but you'll find us bargain hunters packing our bags for Buffalo. In fact, in developing its most recent "Happiest Cities to Work" report, CareerBliss evaluated numerous job-satisfaction factors beyond compensation. These factors included: one's relationship with their boss and coworkers, the work environment, job resources, growth opportunities, company culture, company reputation, daily tasks, and job autonomy. This effort resulted in a top 10 list that includes several relatively lesser-known destinations. But, how much money does it take to buy a dream home to go with that dream job in these markets? HouseCanary set out to answer that question HAPPIEST CITIES TO WORK VS. 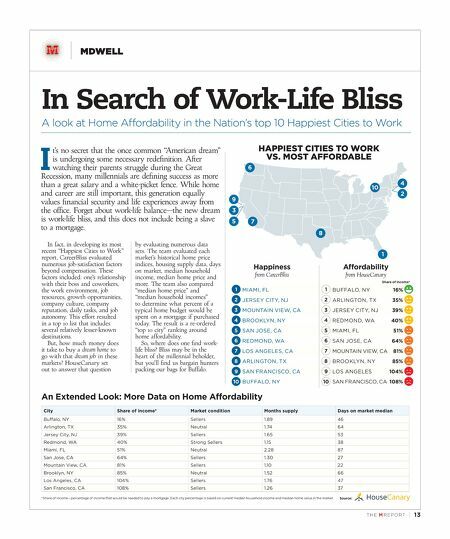 MOST AFFORDABLE Affordability from HouseCanary BUFFALO, NY ARLINGTON, TX JERSEY CITY, NJ REDMOND, WA MIAMI, FL SAN JOSE, CA MOUNTAIN VIEW, CA BROOKLYN, NY LOS ANGELES SAN FRANCISCO, CA 16% 35% 39% 40% 51% 64% 81% 85% 104% 108% Happiness from CareerBliss MIAMI, FL JERSEY CITY, NJ MOUNTAIN VIEW, CA BROOKLYN, NY SAN JOSE, CA REDMOND, WA LOS ANGELES, CA ARLINGTON, TX SAN FRANCISCO, CA BUFFALO, NY An Extended Look: More Data on Home Affordability 1 10 8 7 6 5 3 4 2 1 9 2 3 4 5 6 7 8 9 10 1 2 3 4 5 6 7 8 9 10 City Share of income* Market condition Months supply Days on market median Buffalo, NY 16% Sellers 1.89 46 Arlington, TX 35% Neutral 1.74 64 Jersey City, NJ 39% Sellers 1.65 53 Redmond, WA 40% Strong Sellers 1.15 38 Miami, FL 51% Neutral 2.28 87 San Jose, CA 64% Sellers 1.30 27 Mountain View, CA 81% Sellers 1.10 22 Brooklyn, NY 85% Neutral 1.52 66 Los Angeles, CA 104% Sellers 1.76 47 San Francisco, CA 108% Sellers 1.26 37 MDWELL A look at Home Affordability in the Nation's top 10 Happiest Cities to Work I t's no secret that the once common "American dream" is undergoing some necessary redefinition. After watching their parents struggle during the Great Recession, many millennials are defining success as more than a great salary and a white-picket fence. While home and career are still important, this generation equally values financial security and life experiences away from the office. Forget about work-life balance—the new dream is work-life bliss, and this does not include being a slave to a mortgage.